Cultural organizations are putting together events, exhibits and other programs to mark the state's bicentennial. Get ready to hear a lot about Joshua Chamberlain, Margaret Chase Smith, Henry Wadsworth Longfellow and other famous Mainers. As the state prepares to mark its bicentennial in 2020, cultural organizations across Maine are planning exhibitions, conferences, parties and general celebrations that tell the stories of great men and women from Maine, explain how we got here and where we’re headed. At the same time, the state’s tribal communities will remind people the Wabanaki have lived on the land, only recently known as Maine, for thousands of years and that statehood represents the disruption of lives of the region’s first people. In the 18 months ahead, music will be composed, plays performed and poems recited in Maine’s honor. About 2,400 people have purchased bicentennial license plates for their vehicles, and the Portland Museum of Art is conducting a public campaign asking everyday Mainers to help select the 20 most iconic objects – from the PMA collection and across the state – that tell Maine’s story, or part of it. The Portland Symphony will perform a concert that features the music of Maine-born composer Walter Piston, Opera Maine is finalizing plans to present an opera with Maine ties and Portland Stage is stacking its 2020 calendar with plays and staged readings about Maine and by Mainers, including a new one by Portland playwright Callie Kimball about the suffrage movement, which honors its own centennial in Maine in 2019 and nationally in 2020. Many of the theater’s upcoming plays will reference the bicentennial of Maine and the centennial of the suffrage movement, said the theater’s artistic and executive director, Anita Stewart. Many of the organizations are keeping details of the events secret until the bicentennial year gets closer, but the celebration is at our door. About 2,400 people have purchased bicentennial license plates for their vehicles. In April, Maine Historical Society opens the first major bicentennial-themed exhibition at its Portland gallery, with “Holding Up the Sky.” The exhibition will provide context for statehood by telling the 13,000-year history of the Wabanaki and their continued presence and vitality. Tilly Laskey, the historical society’s outreach coordinator, is curating the exhibition in consultation with eight Wabanaki advisors. 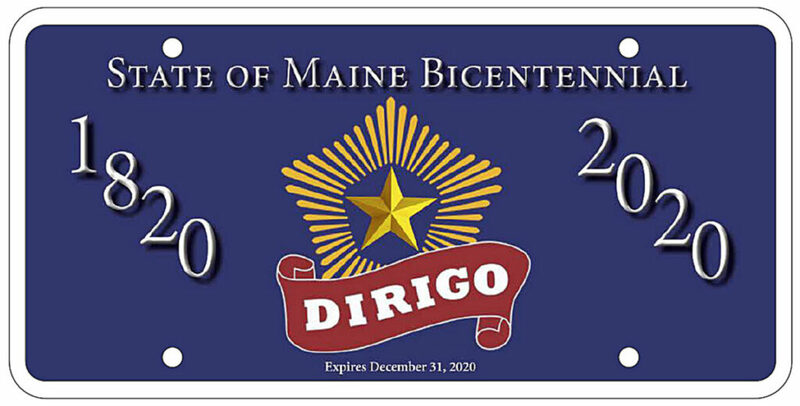 Much of the branding for the bicentennial falls under the auspices of the Maine Bicentennial Commission, which was established two years ago to build a framework for the statewide observance. It created a logo and tagline – “Maine200: Leading the Way” – that suggests endurance and forward-looking strength. Its members have been meeting for months, and their work has become intense, said state archivist Dave Cheever, the commission’s vice chairman. The commission’s first official bicentennial event is this summer, on July 19, the date 200 years ago when voters overwhelmingly supported separation from Massachusetts. 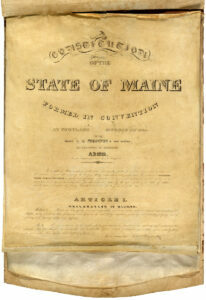 (Maine became an official state March 15, 1820, its entrance to the Union delayed by the national debate over slavery). Details of the kickoff event in July are still under wraps, including its location. But the kickoff almost certainly will involve the raising of the official bicentennial flag. The bicentennial commission will plan another big event March 15, 2020, and a closing celebration in October 2020. The first page of Maine’s Constitution. Voters supported separation from Massachusetts in 1819, but the state’s entrance to the union was delayed until 1820 by the national debate over slavery. In between, the commission hopes communities statewide will plan their own events, incorporating what Cheever calls “the bicentennial bunting” in their planning and promotion. “We’re not so much a clearinghouse of approval but a clearinghouse of enthusiasm and ideas,” he said. The most apparent example of the bicentennial fever is at the Portland Museum of Art, which is collaborating with the Maine Humanities Council on an exhibition that will include 20 objects that represent 20 Maine stories, to open in spring 2020 at the museum. In addition to meeting with advisory groups across Maine to ensure that collections beyond the walls of the Portland museum are represented, the museum is asking for input from the public through its website, portlandmuseum.org. Museum director Mark Bessire and Maine Humanities executive director Hayden Anderson both said it’s impossible to come up with 20 objects that tell a complete story. But it will be fun to try, and a big component of the exhibition process is hearing what’s important to the people of Maine, Bessire said. “Objects tell great stories, and we’re interested in identifying the iconic objects of Maine,” he said. Those could include paintings and sculpture, historical artifacts such as the state constitution, family heirlooms, maps, photographs or cultural objects like an L.L. Bean boot, Indian basket, wooden lobster trap or a spool from a mill. The objects will be grouped in four categories: fine art, cultural, industrial and natural. There will be no wasted space with just 20 stories, Anderson said. Each object will be selected because of the larger story it represents and how important that story is to Maine’s history, in the eyes of the exhibition’s curators. The museum based its 20-in-20 idea on the British Museum’s “A History of the World in 100 Objects” project. The final decisions might involve blood. Imagine if there’s only one painting among the 20 objects. 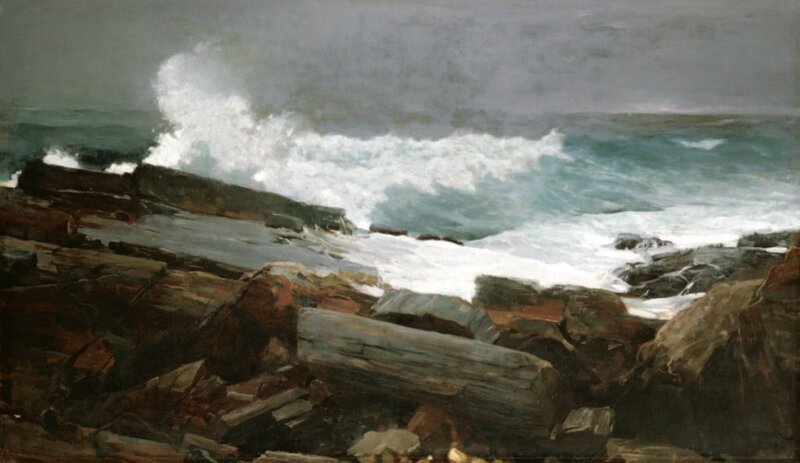 How would curators choose among Winslow Homer’s “Weatherbeatean,” painted at Prouts Neck and in the collection of the PMA, or Marsden Hartley’s “City Point, Vinalhaven” at Colby College, or a Frederic Edwin Church painting of Katahdin? Homer is among the top American painters, who made his most important paintings in Maine. Hartley is Maine’s best native painter and a great American modernist, and Church, perhaps America’s most storied landscape painter, studied and painted Maine’s most famous mountain as no other – including Hartley. How do you choose one over the others to represent the history of fine-art painting in Maine? Does Hartley’s status as being born in Maine outweigh Homer or Church, who adopted Maine as their muse? And what about everybody else? Those are the kinds of discussions that will guide the selection process, said Diana Greenwold, the museum’s associate curator of American art. Still untitled, the exhibition will be on view for six months. There also will be a digital component, so it will exist in some capacity after it closes. Greenwold said organizers are mindful about being inclusive and respectful of history, which means different things to different people. This PMA exhibition will celebrate Maine’s history with the recognition “that many parts of our history are problematic. We are interested in things that are wonderful and unique and worth celebrating and also things that are part of our history that are not easy to talk about and uncomfortable to tell but that are still a part of our story,” she said. In Bar Harbor, the Abbe Museum also is in the planning stages of its principal exhibition dealing with statehood, “Dawnland 2020.” Dawnland refers to the homeland of the Wabanaki, or the People of the Dawn, which includes members of the Abenaki, Maliseet, Micmac, Passamaquoddy and Penobscot nations, as well as the communities of indigenous people who have lived here for thousands of years before European settlers arrived in the 1600s. The Abbe is dedicated to showcasing the history and culture of native people of the region. Darren Ranco, a Penobscot and anthropologist at the University of Maine, and Suzanne Greenlaw, a Maliseet and doctoral candidate at UMaine, will curate the exhibition. Almost certainly, the exhibition will include a copy of the state constitution and various treaties that were signed by the tribes and the state and federal governments and then broken, Catlin-Legutko said.